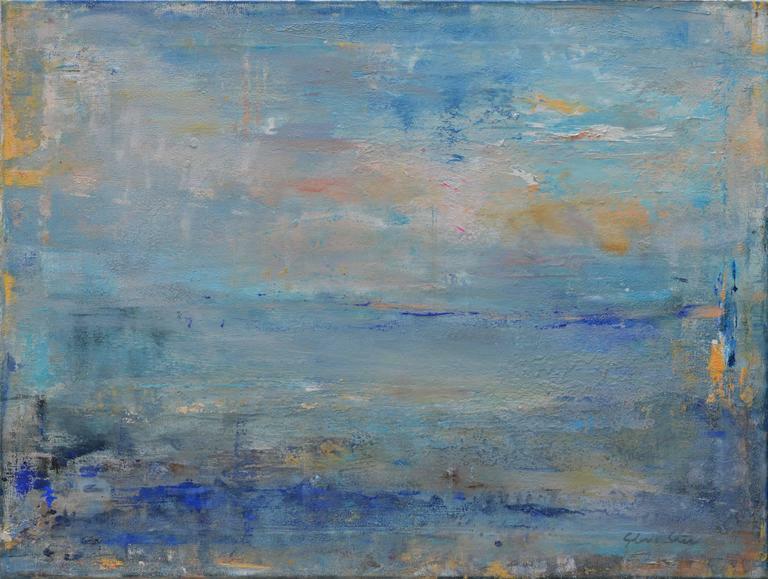 "Sea - Mar" by Gloria Saez is a horizontal landscape in oil paint on canvas with soft blues, touches of yellows, pinks and purples. The layers of under-painted color infuse each stroke. This is an abstract representation of a sea that stretches out to a distant horizon where it seems like the water meets the sky. The brush strokes are controlled yet fluid interpretations of shapes and colors creating a deep perspective. This 28.25 by 38 inch painting measures 29.75 by 39 inches in an elegant yet simple white wood floater frame and is signed by the artist. Gloria Saez is an Avila, Spain based contemporary oil painter and educator whose paintings are inspired by nature's landscape forms and patterns, color relationships, light effects and reflections, and the play of textures. Gloria Sáez began her training at the School of Fine Arts in Avila, Spain and later graduated from the University of Salamanca with honors in painting, sculpture, and print making. She was awarded a Sócrates-Erasmus Scholarship to study at The Escola Superior de Tecnología, Gestáo in Portugal. In 2003 Gloria Sáez became an honorary professor and collaborator at the School of Fine Arts at La Universidad Complutense de Madrid. She has had exhibitions throughout Europe, Africa and the United States.